Park Utd (blue) v Woodhall (red). Craig Mountain (blue), Jack Draper (red). In the Workforce Unlimited Premier Division, Old Leake took the three points from in-form leaders Pointon. The hosts won 2-1 on the day. Fulbeck United travelled to Wyberton Reserves looking to keep up their good form and they put 11 past the home side. Fulbeck’s goals came from Paul Crampton (five), Nick Bates (two), Michael Cliffe (two), Alex Hales and Ben Light. Benington took advantage of Fishtoft’s struggling form to win 6-0 whilst Skegness Town Reserves had a strong 5-0 home win against Ruskington Rovers. A close game at Garfitts Lane saw Railway Athletic make it back-to-back league wins after a narrow 4-3 success against Leverton. 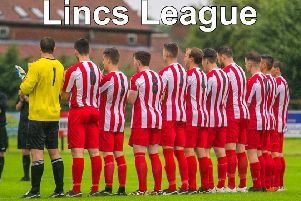 Spilsby Town won 3-0 at Billinghay Athletic while Coningsby left with three points in a 4-1 victory at Swineshead Institute. In Division One, Boston College ran away with the win in a strong 5-0 success over Sibsey. College’s goals came from Nathan Rivett, Billy Hodgkiss, Andrew Thompson and a brace from Troy Randles. Horncastle Town Reserves also won 5-0, their victory at the expense of Freiston. Neither Pointon Reserves nor Swineshead Institute Reserves could find a winner as their game ended level at 4-4. In Division Two, Fosdyke moved into first place when they caused an upset at FC Hammers, putting six past the home side. Daniel Fletcher put Fosdyke in front early on, and his effort was followed by goals from Alex Cammack (three), Ashley Davis and Declan Sands. Boston International were looking for a win but home side Coningsby Reserves just pipped them 2-1 win. FC Wrangle put another three points on the table after a 3-2 win at Holbeach Bank. In Division Three, Eagle United secured another three points in a 4-0 win at home to Woodhall Spa Reserves. Fosdyke Reserves scored the only goal at Digby, whilst Spalding Harriers put seven past Northgate Olympic. Benington Reserves and Boston College Reserves drew 2-2. Kirton Town and Woodhall Spa United secured their places in the final of the Target Newspapers Challenge Cup. Woodhall Spa United won 3-1 at Park United and Kirton Town edged a 3-2 win at Skegness United.